Is it just me, or does waiting on God make you want to flip your crazy switch? This is what happened to Sarah (Sarai) in Genesis 16. God had promised her and her husband, Abraham (Abram), a child despite the fact that she was past child-bearing age. After waiting and waiting, she came up with the crazy idea to give her handmaid, Hagar, to her husband in hopes that he could impregnate her with the promised child. As if God, the Creator of the Universe, needed her help. Funny how something so ludicrous can sound so logical when we decide to not wait on God. Consequently, Sarah’s refusal to wait upon God introduced a series of issues, some of which still linger today in the Middle East. Every time I have not waited on God it has created problems. 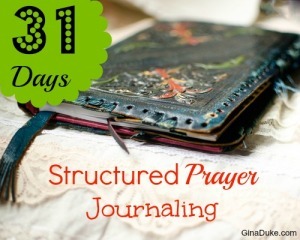 Truly, “we cannot see the whole scope of God’s work from beginning to end” – well, unless we are prayer journaling – you know that thing we do that brings the spiritual things into our visual presence where we can physically see the hand of God. 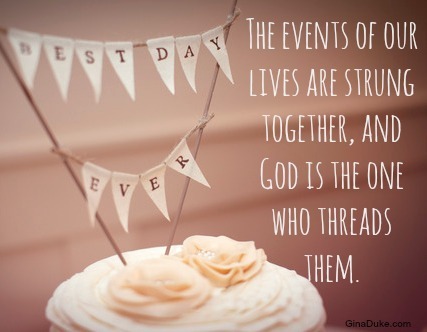 The events of our lives are strung together, and God is the one who threads them. When I look at how God has stair-stepped me down from a career in corporate human resources to full-time ministry in the last few years, I can perfectly see how His timing worked – and it is beautiful. I can even see how a No to some of my prayers were part of God choreographing His timing in my life. I hope you try it. It will definitely add another dimension to your prayer life that you may have been overlooking. What’s on your heart? What are you passionate about? Tomorrow, I will be talking about how we can capture these thoughts! Tune in.